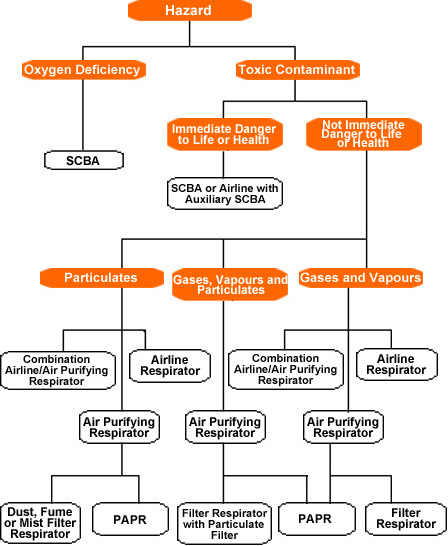 It is not possible to set out precise requirements for every industrial situation where there is an inhalation hazard because the factors that have to be considered vary from one workplace to another. Both the user and the supplier should be satisfied that the equipment selected is adequate for the conditions. If in doubt, you should seek technical advice from your equipment supplier, or your local branch of the Occupational Safety and Health Service of the Department of Labour (OSH). These may cause discomfort (i.e. cough or phlegm) or minor irritation of the nose and lungs but are normally not toxic and do not permanently damage the lungs. They pass out of the body or remain in the lungs without poisoning the system. Examples are calcium carbonate (limestone dust), starch and sucrose. Respirable particles of these dusts remain in the lungs where they may damage the tissue. For example, asbestos, crystalline silica (quartz dust) and coal dust. Chemically active particulates that cause immediate discomfort, irritating or inflaming the airways to the lungs. Examples are acid or alkaline mists and cement dust. Dusts that produce flu-like symptoms and fever, sometimes several hours after exposure. For example, fumes evolved from welding zinc or copper. These pass from the lungs into the blood and may poison the whole body. For example, lead, arsenic and powdered organophosphate pesticides. Particulates in low concentration that may cause an allergic reaction. An example is mould. These are fine droplets of liquid dispersed in the air and may contain particles of dissolved substances. Mists are produced by condensation of a vapour or by atomisation of a liquid. Examples are paint spray and chromic acid mist from an electroplating bath. These are fine particles of metal, produced by condensation of the vapour, given off by a metal when it is subjected to high temperatures, for example, during welding and smelting. NOTE: Inhaled particles deposited in the mucus in the respiratory airways will enter the body when swallowed. Acid gases, e.g. hydrogen chloride and sulphur dioxide. Alkaline gases, e.g. ammonia and diethylamine. Before entry into a confined space, it is essential to carry out a full assessment of the likely contaminants and possibility of oxygen deficiency. A decision on the appropriate type of respiratory equipment and other safety factors will then need to be made. For further information, see the booklet 'Safety in Confined Spaces' available from your local OSH branch office. People with impaired lung function may experience difficulty breathing. An asthma attack may be made worse or induced in susceptible individuals. People with circulatory disease such as heart disease and anaemia may be adversely affected. People prone to epilepsy should be aware of the special dangers of wearing a respirator should a seizure occur. The wearing of contact lenses or spectacles may restrict the type of respirator that can be worn. Psychological factors such as claustrophobia may preclude the wearing of respirators. Facial characteristics such as prominent cheekbones, deep skin creases, lack of nose bridge, etc. may lead to respirator facepiece sealing problems. For further information refer to 'A Guide to Respirators and Breathing Apparatus' published by the Occupational Safety and Health Service of the Department of Labour, Wellington.